2. Click the Refresh button ( ) on the browser, or hit the F5 key on your keyboard if you use a Windows computer. 3. You will see a Connect to Xero button appear. Click it. 4. You will be directed to the Xero login page. 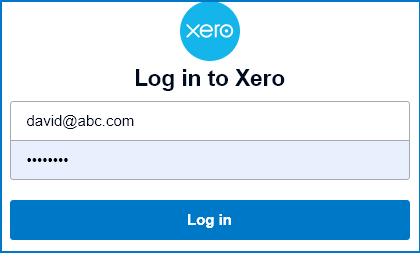 Type in your Xero user name and password to login (if you are not logged in yet). 5. You will be asked by Xero to authorise EzzyBills to access your Xero Data. Choose the correct company account, then click “Authorise“. 6. Back in EzzyBills, click Settings, then click “Refresh GL” to reload data from the new Xero company (such as account codes).